I am a jet-lag fighter. I like to think that I can go from one time zone to another with out missing a wink. I fully expected to come back from China and need about a day or two to adjust and then be fine. HA! I think the fact that I fell asleep on the couch by 8 pm 4 out of 5 nights this week proves otherwise. I was exhausted this week, which was a huge bummer because I had a lot of plans to jump right back into my kitchen and make dinner every night. The night I made lasagna was a huge personal accomplishment and utterly wore me out. To the point that the next night we just had sushi. By Thursday I needed something simple. This one-dish meal (well one dish and a measuring cup) was just what the doctor ordered. Besides being fast and easy to throw together, this meal is light but filling at the same time. 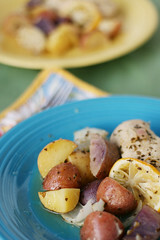 The lemon really brightens the potatoes and chicken. Jesse liked to take each bite and rub it into his lemon slice. Flavor wise this is the perfect summer meal and in San Diego, where there is a breeze and the temperature is in the mid-70’s, I don’t mind turning my oven to 400 degrees. But, if you’re in the part of the country that is over 100 degrees you may want to wait until it cools down a little! **Your eyes are not playing tricks on you, there are no peppers or mushrooms in the picture. 15 minutes into roasting I realized I had forgotten to add these, but I’m including them in the ingredients because I know they will be great. In a large oval baking dish, or a bar pan with at least 1 inch tall sides, lay out the onions, potatoes, peppers, mushrooms. Pour 1/2 of the lemon juice over the vegetables and use (clean) hands to evenly coat. Add the chicken and lemon slices to the dish and arrange so the vegetables are surrounding the chicken. Pour the remaining lemon juice mixture over the chicken and use a pastry brush to evenly coat. Cover the dish tightly with a lid or aluminum foil. Bake for 30 minutes then remove the cover and bake for an additional 15-30 minutes, or until the juices of the chicken run clear and the potatoes are fork tender. Occasionally baste the chicken and vegetables with the pan juices. Hoagies are a staple in our meal rotation. I like them because they are so versatile and usually very quick to throw together. I make steak hoagies, chicken hoagies, meatball hoagies… you name it, we’ve probably put it on a hoagy roll for dinner. Now, one day, I will get around to making my own rolls but for now the LaRosa’s kind work perfectly. (LaRosa’s is a popular Cincinnati pizza restaurant and they sell these rolls in our local grocery store) For tonight’s dinner I went the Chicken Philly route. In a large skillet, over medium-high heat, melt the butter. When the pan is hot and the butter is melted drop in the onions, mushrooms and peppers. Reduce the heat to low-medium. Cook until the onions start to turn gold brown about 10 minutes. Stir often. Half way through add the salt and pepper. Spoon the chicken/vegetable mixture onto the bottom half of the hoagy roll. Lay the cheese on top of the meat and then put the top half of the hoagy roll back on. Bake for 6-8 minutes. Serve with chips or oven fries. This recipe will make enough filling for 3-4 hoagy rolls. I usually only make 2 and save the rest of the filling. Later in the week I’ll heat the filling up in a skillet, add some chicken broth, garlic, cream and a few other spices and toss with pasta. Voila, two meals from one nights prep! We really love chicken. I think we could probably eat chicken every night and be perfectly fine. Actually, once I was making a weekly meal plan to grocery shop and I realized that every single meal I had planned used chicken. Sometimes though, I feel like I run out of fun ways to use it. You can only have chicken parmesan, chicken calzones, and chicken pasta so many times. That’s why I was so excited to see this recipe in my friend Amber’s blog. It’s such a simple concept and yet I have not made anything similar, at least in a long time. Amber said that she wanted to tweak the sauce a little bit so I made a few changes of my own. With this chicken I served roasted Yukon gold potatoes and peas. Preheat sauté pan to medium heat and add in olive oil and garlic. Add chicken to pan and cook until done. Remove chicken from pan and place on a plate, tent with foil to keep warm. Sprinkle some of the left over flour into the pan and cook for a minute to dissolve flour. Add the broth and deglaze the pan. Simmer until thickened. Add in remaining seasonings and stir to mix. 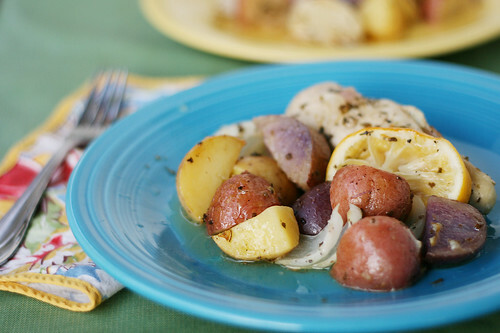 Drizzle the garlic herb sauce over the chicken and potatoes. The best mac and cheese you’ll ever put in your mouth…. Was that title too long? 🙂 LOL. In all seriousness, this is really the best mac and cheese I have ever had. I found it on one of my all time favorite blogs Pioneer Woman Cooks. I’ll admit, I’m in love with Ree. Her blog is full of witty commentary and informative cooking entries, plus she has the cutest family ever. If you haven’t had the pleasure of viewing her blog before please go check it out, you’ll be hooked!